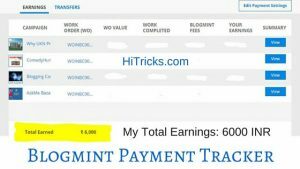 Hello Everyone, I feel glad to introduce yourself to one of the most trusted and income generating platform for Bloggers, Twitteratis and YouTube Video Makers, which is none other than Blogmint. I am writing this after properly using this platform for over 6 months since March, 2015. Over this period of 6 months, I did just 4 sponsored campaigns which earned me a total of 6000 INR which is almost equal to 100$. Maybe the time period is longer, but look at the average payout per campaign, that’s 25$. Indeed that’s something exciting. Before going further, let’s explain what is Blogmint exactly. For bloggers it is a platform to earn money by writing sponsored blog posts given by brands. For YouTube marketers it is a platform to create sponsored videos and earn. For twitteratis, it is a platform to share sponsored tweets and earn! For brands, it is a rich source of all the above 3 categories, bloggers, YouTube marketers and twitteratis to promote their latest campaigns successfully, with whom they can interact directly, give them work orders, check out their final presentation draft, and then finally give payouts. 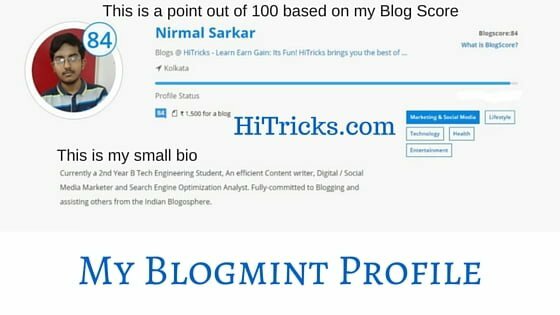 I joined Blogmint back in March, 2015. I got chance to work with AskMeBazaar, Airtel, ComedyHunt and RealtyCompass. AskMeBazaar Campaign: [March, 2015] With AskMeBazaar I have promoted their products on my blog. My topic was to write on Smartphones around the range of 15k, which are available to buy at their website. Well, as it was my first Sponsored Post, the writing quality is not as much good. Airtel Campaign: [August, 2015] After AskMeBazaar Campaigns, I could not take up more campaigns due to lots of engagements during May-July. After a long gap of almost 5 months, I opted in for my second sponsored post with Airtel. My campaign was to promote Airtel 4G Launch: The fastest network in India. ComedyHunt Campaign: [September, 2015] This campaign was one of the interesting ones of my all campaigns. My task was to promote how LiveInStyle is encouraging StandUp Comedians to give them universal exposure. Along with that, I added Top 10 YouTube StandUp Comedians to follow, which was just amazing as I love all of them from my heart! RealtyCompass Campaign: [October, 2015] This is a perfect example of how a sponsored post should go. In this campaign, they wanted me to write on one of their Projects: UKn Belvedere in Bangalore, a large society opening in mid-2019. 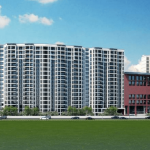 I wrote about the property details in my post along with the contact number of the builder. Naturally, people searching for the property online have higher chances to land on my page website in the coming months gaining me lots of organic traffic. Blogmint also provided me opportunity to get sponsored posts from advertisers outside of Blogmint. 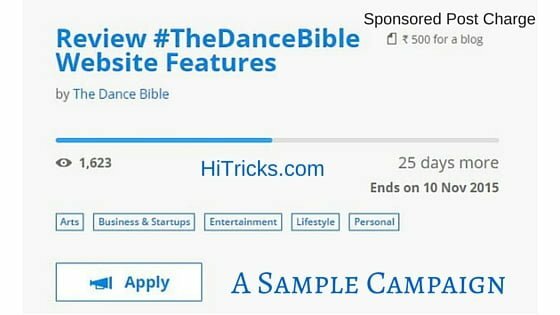 I have wrote sponsored posts for MoboMarket and CouponDekho side by side. This was possible only and only due to Blogmint, as I could show these brands my past reviews as an example before getting their campaign orders. 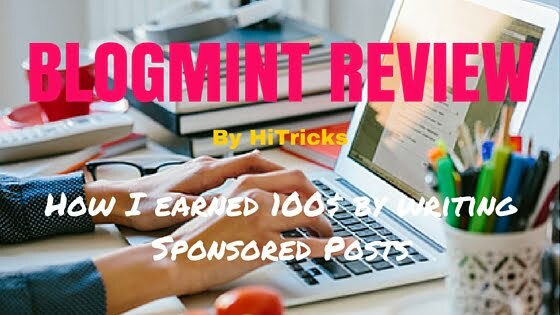 Nowadays it is very hard to get sponsored posts, Blogmint truly helped me achieve this. I got more 2000 INR from these campaigns. Blogmint does not end on Blogging itself. If you have a YouTube Channel, you can earn by making YouTube Videos promoting advertisements. If you have good number of followers in Twitter than you will get new campaigns every week. Brands prefer twitter as a good Promotion Media. One of my closest online buddies, Soaham Chaturvedi got a chance to attend the launch of Honda All New Jazz at Buddh International Circuit near Delhi. It was a 2-day trip, and his entire trip including flight tickets from Gujarat to Delhi and back, Food and Lodging was sponsored by Honda themselves. It was a fun overall, and chance to meet with other bloggers and eminent Personalities. Lastly, he also got to write a blog on Driving All New Jazz at Buddh International Circuit and got paid for that separately. Isn’t it fun? Few days ago, Times Internet organized a Talvar Movie Review campaign for the bloggers of Mumbai and Delhi where they organized a special film preview to selected Bloggers 2 weeks before the release and asked them to write a review. I missed at as I am from Kolkata, but it was indeed an awesome opportunity. And more… And it never ends. 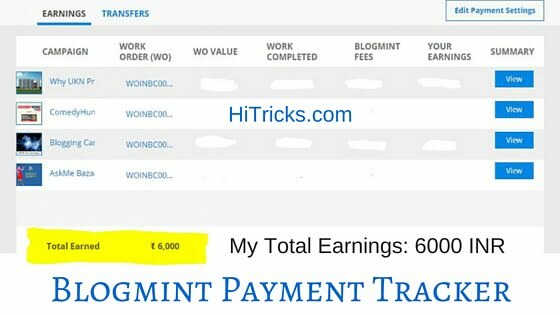 So if you are a blogger, own a blog then better make yourself earn some bucks from Blogmint, Join Blogmint Now. You can join Blogmint from here. Next, you need to improve your profile so that you look professional. Add a small bio highlight. After that, add your blog demographics in your settings. [You can see them in the settings itself, it is very easy to navigate and understand] Finally, add up your bank account details [optional, you can add later if you like]. Your sponsored post income will be auto-transferred to your bank account within 2 weeks after the post gets published. There is a payment tracker from where you can clearly track all payment details. You are done and all set for your beautiful journey with Blogmint. Now start discovering Campaigns and apply for the campaign you will be able to blog on. You can find a list of available blogging campaigns, twitter campaigns and choose from them. You can apply to as many campaigns as you like. Before applying to new campaigns, kindly read the campaign details given. Some campaigns enable you to choose the charge you want, and some campaigns have pre-set charge per post. Note: Do not choose off topic or the topic you are not able to write properly. Choose the topic you know your users will be interested in. 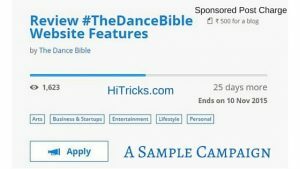 I got offers on sports niche on Blogmint, I rejected. It does not match my niche. After applying for the campaign, wait for the brand to respond back. They will approve your campaign and give you the blog topic to write on. This response is generally fast. In some cases they may reject your blog, considering they have already got enough bloggers or your blog is off-topic or any other reason. Note: Do not start writing blog before you get approval from Blogmint. It will be waste of time. After you get approval, check out the topic assigned to you for blogging and start writing your blog draft post. Follow the instructions given. Clear instructions are given by them what to include, from where to take data from etc. Generally you get around 5 days to submit the post. Write quickly overnight and submit the draft as soon as possible to gain the attention of the brand. Tip: Blogmint has their own draft writing area where you need to submit your draft. They also have a source code submission where you can input html codes. My tip is you start writing your post in your blog itself, and add relevant images etc and prepare it fully. After that, copy the entire post html and submit that html to that Blogmint draft adding page. So your task of writing blog draft was made easier. After submitting draft, wait for the brand to review it. They may comment on your post suggesting improvements if required. Do the necessary changes and re-submit. Finally they will approve your blog for publishing. BOOM! You are good to go. Make your blog post LIVE! After that you are required to share your post on social media to get traffic. Your payments are generally approved soon after the brand approves your final blog. It gets reflected to your account very soon. Additionally, you receive comments on your profile from the brand you have worked for. 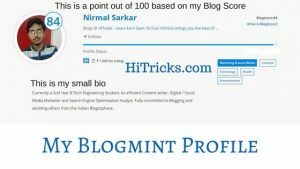 Having good reviews in your Blogmint profile is again helpful for getting your future brands. So, hope you have got the idea how Blogmint works. Now it’s time to act. Join Blogmint and get ready to meet new brands and make a better future for your blog. And this is just the beginning, Blogmint is spreading wider day by day. This is a rich source to generate constant income. That’s all for now. Hope you got the idea how Blogmint works. Do let me know if you have any troubles regarding Blogmint. Just drop a comment below and I shall respond at the earliest. And please, do share this post with other fellow bloggers who wants to earn a decent income through their blog. Share on social medias, your one share really matters a lot. Thank you for reading my post about Blogmint. Best of Luck for your Blogging Career. Sir blogmint ko kya Ho giya 8-9 month se open hi nahi ho raha. Sir please yodi aapki najar me similar blogmint ki jaise website ho toh please sir aap mujhe comments ke through batay. Thank you. This was very helpful Nirmal. Thank you. Inspirational Nirmal ! Thank you for the post ! The perfect Make Money platform To Monetize my Blogs! I will try blogmint, with me luck. Thanks for sharing all about blogmint. Really helpful for me..!! hi nirmal i have bought myself a domain name and and made few changes to my blog too,I did some research on wordpress self hosting and affiliate marketing and I have decide to go for it, thanks foe the tip! Do you have any alternatives to BlogMint or any International Alernative. 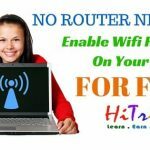 however i do not own the domain name for now, plus I dont have large amount of traffic on my blog, will this affect my profile? also i am writing currently on health fitness do you think it is a profitable niche to be in? Hi Nirmal, this is really exciting. Thanks for sharing. Not at all a user friendly site.. Extremely frustrating, no mechanism to log issues or help.. Disappointed after reading the reviews.